I want to start off by saying a big thank you to everyone who messaged me or left a comment on my last blog post to wish us well in our new house. I was really touched by the number of people who took the time to contact me and it has made me even more excited for the upcoming project. We plan to give Mimi the back bedroom in the new house (you can see the floor plan in my last post). Friends and family who have seen the house have been surprised that we aren’t going to make the small bedroom her nursery leaving the bigger room as a guest room. However, it doesn’t make sense to me to squeeze her into a tiny bedroom that won’t have enough storage for her clothes and toys and will be used day in day out yet leave the bigger room unused for 95% of the time except for the odd visit from guests. In our flat we used her nursery so much from day one and I don’t see that changing – if anything I think she will use her room more and more as she gets older. 1. Pebbles Kids Wardrobe in seagreen 2. Bliss wall shelf with leather straps 3. Loft wooden playpen 4. Salty kids house cabin bed 5. Scandi baby cot in grey 6. Morris bookcase with fold away desk in grey 7. Scandi wall shelf in grey 8. Flint kids computer desk 9. Bliss three piece nursery furniture set in seagreen 10. Rough kids day bed with trundle bed and drawers in white. It was actually the vintage looking wardrobe that caught my eye first as we don’t have one and even though genuine vintage is so nice I know that this brand new wardrobe would be super practical but it still has the character that I want from furniture. I also love that colour! 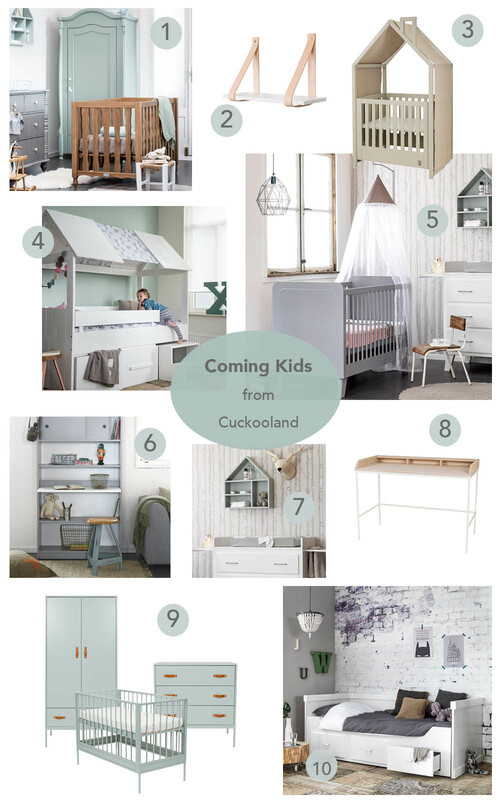 I really like the more modern looking wardrobe with leather handles – nursery furniture does not need to be boring or twee, which is what I find most of the nursery furniture sets that I find tend to be. When I was a child I was obsessed with the idea of having a raised bed with a desk or secret cubby hole underneath so I LOVE the cabin bed and the playpen is brilliant as it adjusts to grow with your child – have a look here to see how it transforms. One of the pieces that we bought for Mimi’s nursery in the flat was a daybed and I felt grateful for it every single day as it proved so, so useful for feeding, stories before bed, dressing her, cuddles in the night when she was sick and it provided lots of storage. Honestly, you need one if you can fit it in. I wish I had bought this one as it looks much nicer than the one we bought and it is actually white instead of off white, which I was never keen on against white walls. I look forward to when Mimi is old enough for a desk in her room as the little writing bureau that I was given by my parents on my seventh birthday was so special to me. I really like the desks by Coming Kids and the shelving unit with the fold down desk seems like a brilliant piece to me. What do you think? Do pop over and have a look at the full range by Coming Kids and let me know what your favourite pieces are. I’ll show you plans for Mimi’s new room soon! *This post was written in collaboration with Cuckooland. 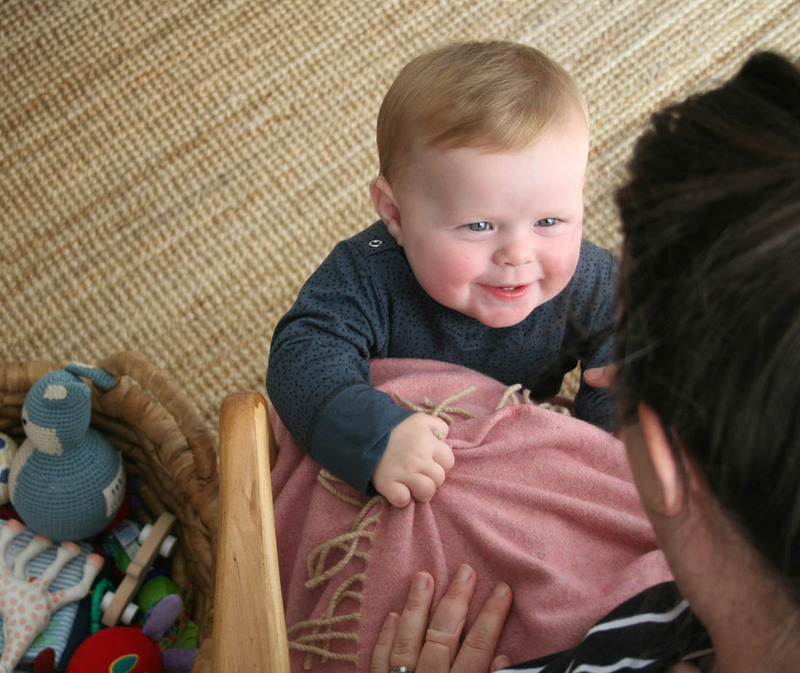 I can not quite believe that Mimi is now nine months old – nine months in, nine months out. In some ways it feels like she has been with us forever but in other ways it feels like yesterday that I was waiting for her to arrive. A lot has changed in the last nine months and it has been a bit like learning a whole new way to live; new routines, new priorities, new levels of tiredness! 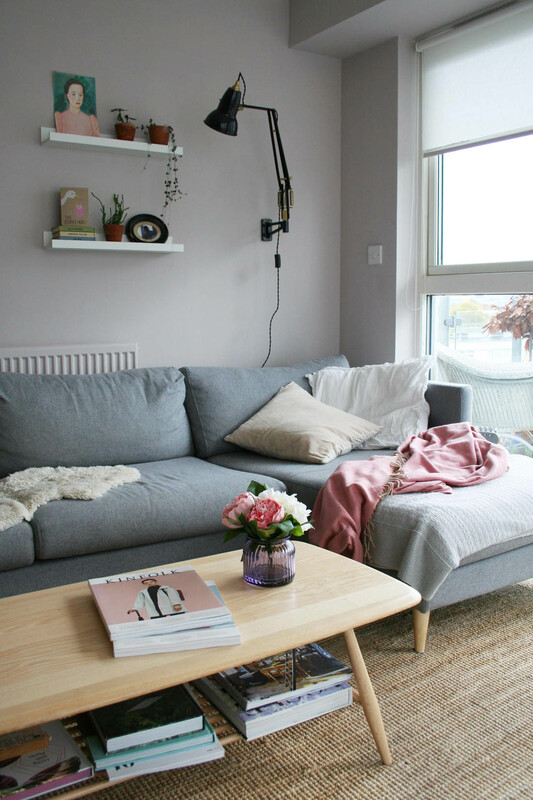 One of the things that I lost control over whilst Mimi was a newborn was keeping the flat looking nice. Dreaded piles of ‘stuff’ started to build up and there was never enough time or inclination to sort them out. Now that she is toddling around and claiming a bit of independence I suddenly have more time and a bit more head space to get things looking good again. Therefore, the other day I simply went around the flat with a big shopping bag and threw every pile of stuff I came across into it to be sorted out in one go (or not!) – it felt so good. Lace cut out ceramic vase and vintage hanging mirror, both from the Fox & Ivy collection. The first surface I cleared was my bedside table as it had become a complete dumping ground. It feels so good to have got rid of all that rubbish. And do you know what? I went and bought myself some flowers to celebrate reclaiming this space as my own. 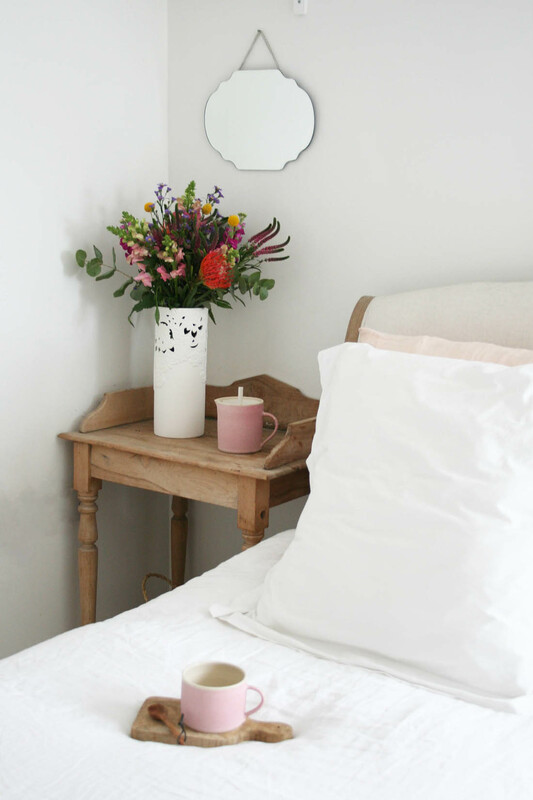 The ceramic vase is part of the Fox & Ivy collection and the delicate lace cut out design is so pretty and adds a touch of femininity to my bed side. 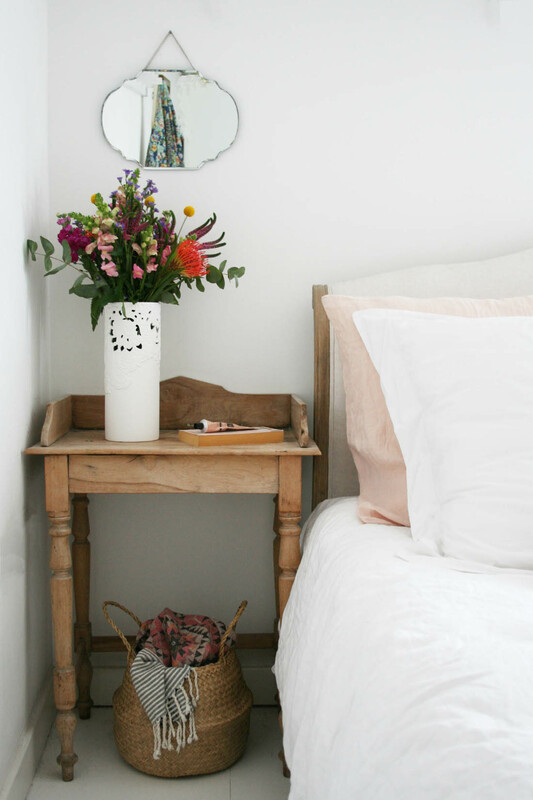 I always tend to add a small vase or bottle of flowers on my bedside table but actually using such a big vase makes a real statement to the point where you don’t really need much else. It would also work really well on a hallway table or in an unused fireplace. One of the pieces I love most from the collection is this vintage inspired mirror. Adding new to old (the bedside table is an antique one that I got very cheaply on eBay – I always get questions about it so just search ‘antique Victorian wash stand’ if you are interested in one similar) works so well and I don’t think you’d ever tell that this mirror isn’t vintage. Isn’t it a pretty shape? 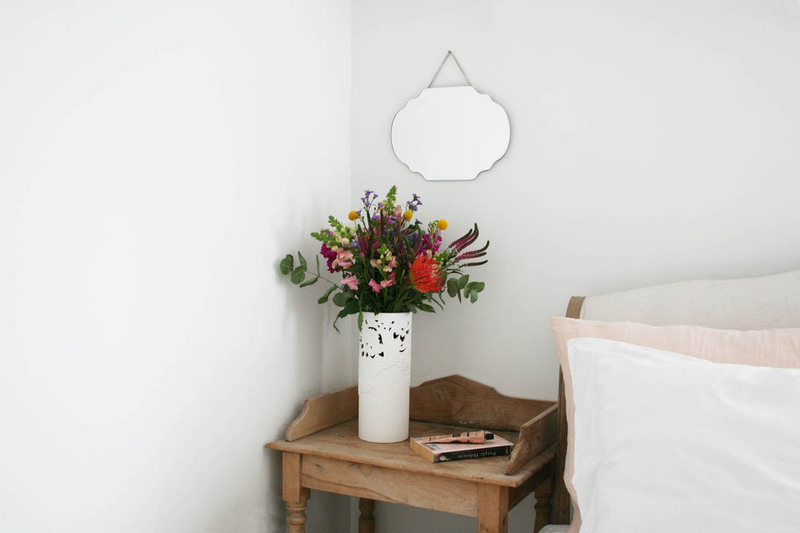 I love the cottage-like feel of the combination of the mirror and flowers. You know when it’s a whole tea pot kind of morning?! The other thing I have finally had time to do is to print out some baby photos. This has been on my to do list for nine months! I find the faff of printing photographs is not so much the printing process but more sorting out what to do with the photos themselves – finding frames and then hanging them. This is why I adore these glass hanging frames (great price too!). You can easily slip the photos in and out as you please (or add dried flowers, mementoes etc) and then hang them on a hook or a cupboard door handle, wherever you fancy really. Also, I removed the chain from mine to add some natural twine to personalise it but you could also use ribbon or a special piece of fabric. I printed out this pic of Mimi and Otto that just melts my heart and hung it on the vintage shelves in Mimi’s room. Gold edge hanging frame from the Fox & Ivy collection. I used to have a plant and a vase of flowers on my coffee table but the moment Mimi started pulling herself up there a couple of months ago it all had to go. However, I noticed this little vase of faux peonies and hydrangeas in the collection and thought that perhaps it could withstand cheeky little baby hands and swishing dog tails for that matter. 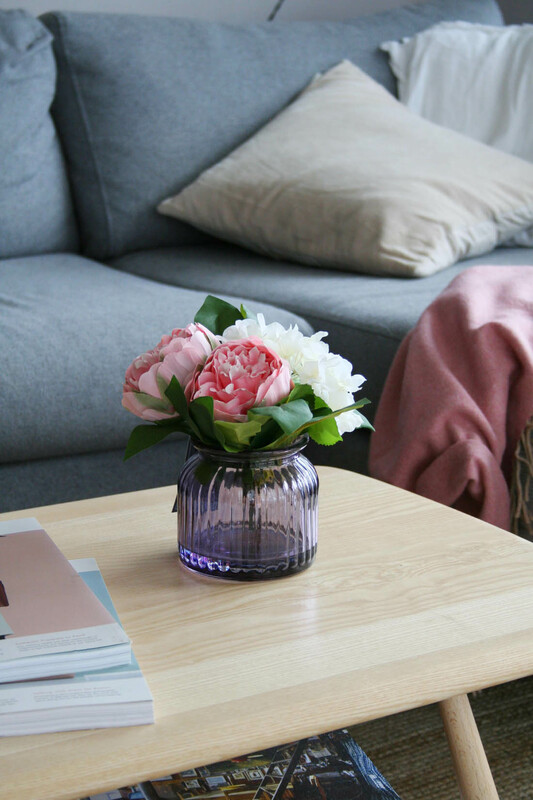 Artificial Peony and Hydrangea in ribbed vase from the Fox & Ivy collection. I always like a few faux plants and flowers – so much cheaper and less hassle than buying and looking after all fresh. I have another little project to do to help us adjust our space to having a baby; we basically need an office space so all these nasty piles stop accruing here, there and everywhere. I will keep you updated on that one. For now I am happy to have added a few new bits to the flat to make it feel a bit more loved. A thank you to Tesco for collaborating with me on this post and do make sure to check out the full Fox & Ivy collection. *This post was written in collaboration with Tesco. As I told you last week I’m working with Homesense this month so I went along to the new store in Greenwich to choose a few things to show you. I went with a shopping list in mind but almost as soon as I got there I was stopped in my tracks by a beautiful chair, that I had no idea that I needed. I fell in love on the spot so I spent my own money buying the chair and the rest of the budget given to me by Homesense on a collection of other great homewares for my living room and more for a wardrobe makeover that I will show you next week. My living room has been taken over by baby toys of late and the worst offender was the bright tacky plastic of the jumperoo. Happily, I gave that away not long ago as Mimi is having none of it now she crawls, climbs and cruises. So, I was left with a gaping jumperoo-sized hole (have you seen those things – they are flipping HUGE! ), which was the perfect spot for the new chair. We have a foam play mat that surrounds the chair normally (when I’m not taking photos 😉 ) and Mimi loves the fact that I sit in the chair and she can play close by and occasionally use the chair as a new climbing frame. I love the mid century vibe of this chair and the colour of the wood is perfect for this room. It also feels really solid and well made. 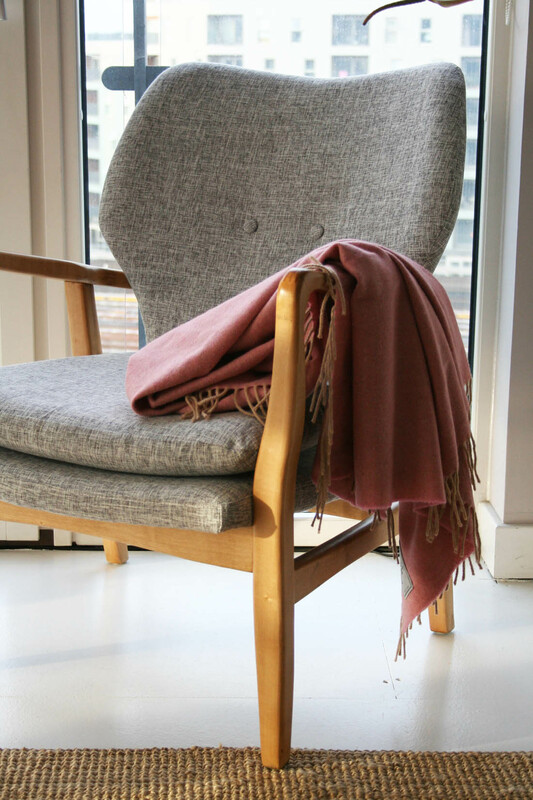 I chose a beautiful wool blanket from Homesense to add a bit of softness and colour to the chair and to help tie in with the colour scheme of this room. Also, as usual, I am getting excited about my favourite season drawing in and you can never have enough blankets once the days get colder. 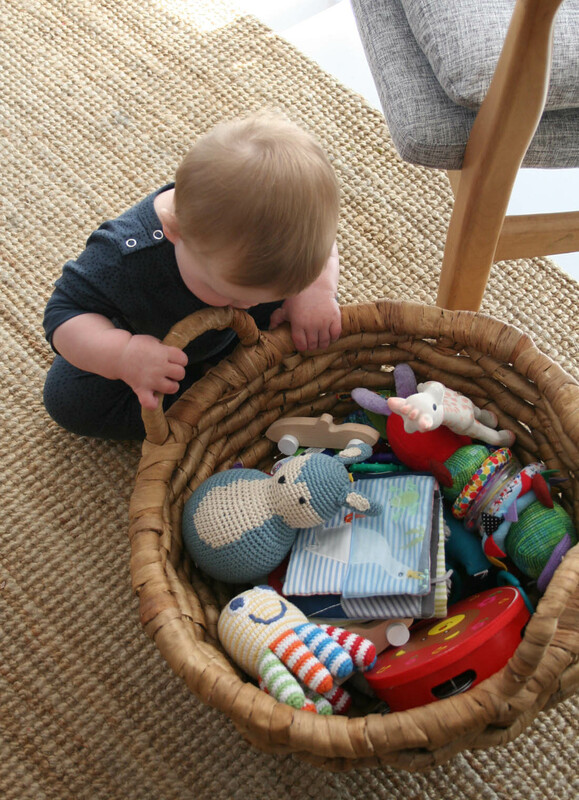 I also bought a new toy basket that is the perfect shape for Mimi to reach into and the best way to keep toys from being strewn everywhere. There was only one of these baskets in store so I was very pleased to get my hands on it. 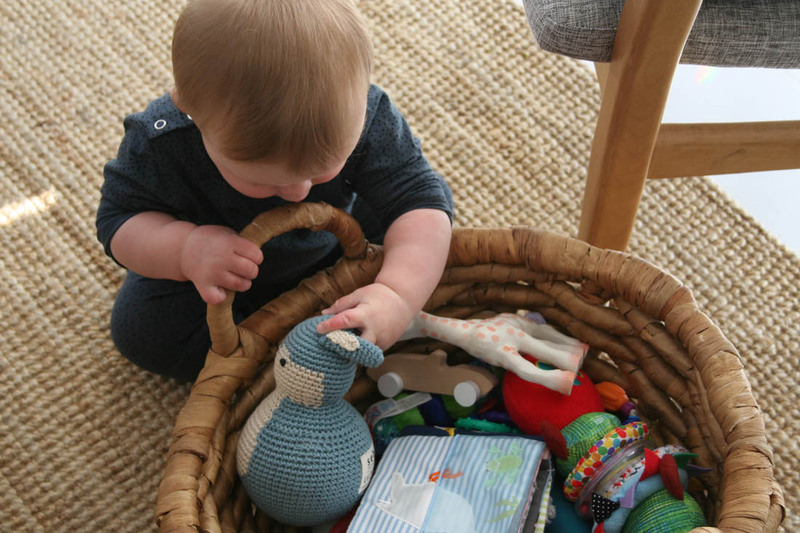 As I mentioned in my last post I was overly excited to find this crocheted bunny toy for Mimi whilst I was at Homesense for only £4.99 compared to the RRP of £29 – I’ve got to grab aesthetically pleasing toys that Mimi will actually like when I see them. There is far too much brightly coloured plastic in my house these days. She really does love the bunny as it rolls around and she chases after it (as does Otto!). Look at those chubby little hands! 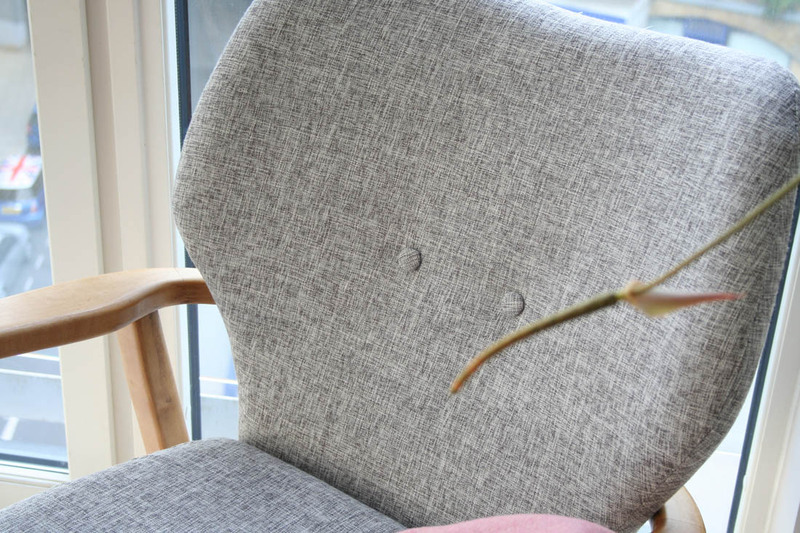 I love the textured grey fabric of the chair as it complements the mid century style and it is very baby and dog friendly (Otto loves nothing more than resting a slobbery chin on chairs). The basket was £12, which I think is a really good price for such a sturdy basket. It’s going to get a lot of use and I really think it will stand up to it. The chair is so comfortable and it’s the perfect place for me to sit whilst Mimi plays and she can’t get enough of climbing up it! I’m so pleased I came across the chair and made the decision to buy it there and then. It’s the perfect addition to our living room. 100% wool blanket from Homesense £29.99. What do you think? Would you expect to find something like this at Homesense? I have to admit that I didn’t but I’m very happy I did. Back next week to show you my wardrobe makeover. *This post was written in collaboration with Homesense. We need to talk about Homesense. I feel like it is my public service to tell you all to get there immediately if you’re looking for…well, actually, that’s the real beauty of the place, you never know what you’re going to find! It is part of the TK Maxx family – think interiors rather than fashion – with a huge variety of homewares, big brands and up to 60% of retail prices…what is not to love? I’m going to be working with them this month so I will try to show you what it is all about if you haven’t been before. These days I am a fully committed online shopper; negotiating London’s shops is completely exhausting. However, I have begun to feel that I am missing out on finding potential bargains or one off pieces. Also, I genuinely enjoy shopping and browsing online doesn’t quite cut being able to browse the aisles and see products close up (don’t you just hate it when you order stuff online and it arrives and it looks or feels nothing like you’d imagined?). Therefore, my recent trip to the new Homesense store in Greenwich was a revelation. I went there thinking I wanted some new cushions and kitchen pans but actually left with a one off piece of furniture, clothes hangers, some baskets and a toy for Mimi. “Find exactly what you weren’t looking for”…so very true. What I love most about Homesense is the thrill of coming across a major bargain and a complete one off (there aren’t rows and rows of the same item like in a lot of high street stores). The stock varies from store to store and day to day, you see, so you never know what you’ll find. I have to admit to grabbing things a little too quickly or protectively putting myself between an item and another customer so that they couldn’t see what I’d found whilst I decided whether or not it was what I wanted. In fact, the day I went I spotted an armchair, of which there was only one, and I walked a few paces away from it to look at it from a distance and the manager started to move it back into position and I mistook her for a customer and VERY quickly had to make it known that it was *my* chair. Ha! If you see a piece of furniture that you love, you need to be quick! In love with his bench. Look at the price! £149.99 compared to the RRP £739! 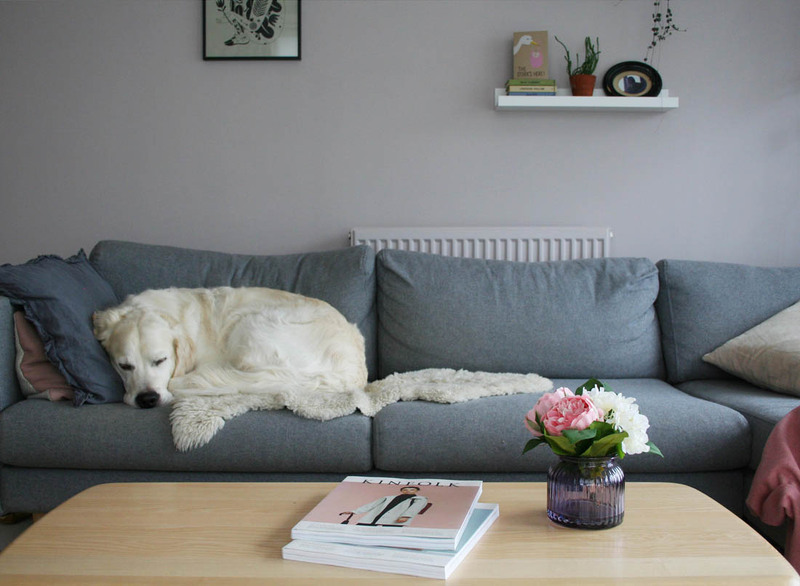 One off sofas and chairs – love the mid century vibe of this sofa. I think it’s a bargain at £299. Statement pieces like this chest of drawers are great finds. 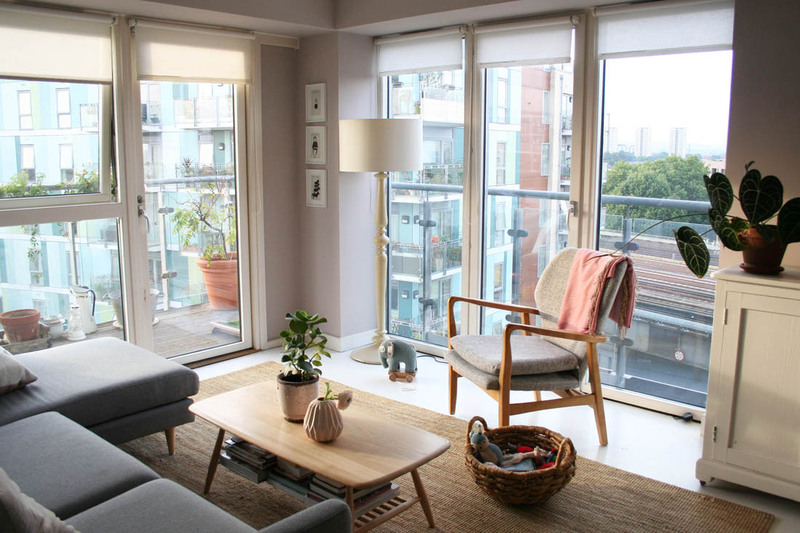 The soft furnishings are also brilliant; a huge variety of unique and on trend cushions and blankets at a fraction of the recommended retail prices as well as great quality. Why did I leave this zebra cushion behind?! Zebra cushion love for only £19. 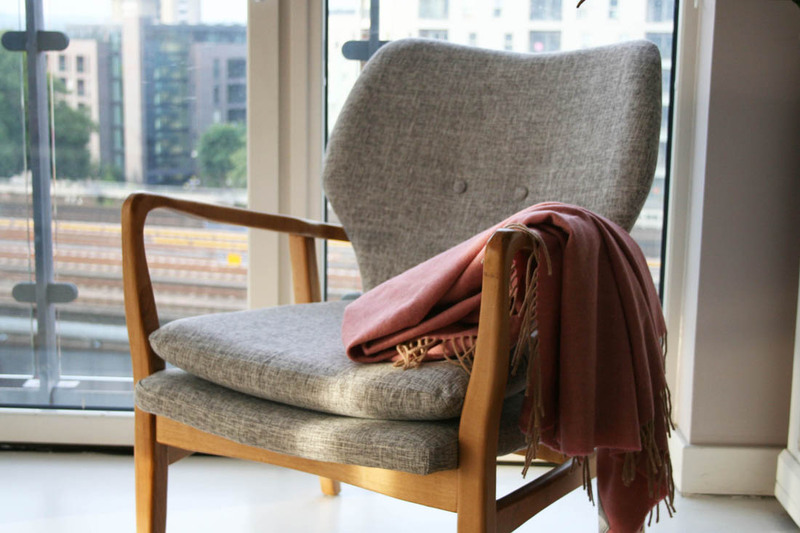 100% wool blankets – perfect for autumn. As well as quirky or one off pieces you will also find a huge variety of every day homewares including a great kitchen department filled with things you didn’t know you needed or wanted and much cheaper than elsewhere, as well as essentials like glasses and crockery. The last time I went I bought some beautiful copper pans that are still serving me very well. The kitchen department is brimming with great stock. Cute enamel pans in lovely colours for only £7.99. Want this teapot! £14.99 instead of RRP £39! These cactus themed friends came home with me – the packed lunch box was only £2.99. I’ve recently pledged never to buy a plastic bottle of water again. There were some really cute kids things in the Greenwich store and I got far too excited about finding these lovely crocheted Danish designed toys for a fraction of the recommended retail price. There will also be loads of things that you would never buy or have in your home in a million years but that’s the great thing about the store; there really is something for everyone and it’s so fun trying to find what is to your taste. One for Mimi and one for her best friend, Olive. These Danish designed weeble toys are so lovely and such a bargain at £4.99 instead of the RRP of £29. Cute flamingo wool blanket for only £19.99 and I like the little house shelf. Such good value faux flowers. Only £12.99 for this plant basket. If you see something you like and there is only one of them you need to decide quite quickly whether or not you want to buy it because the stock varies from store to store and day to day and a one off really is a one off so there won’t be more in the stock room. 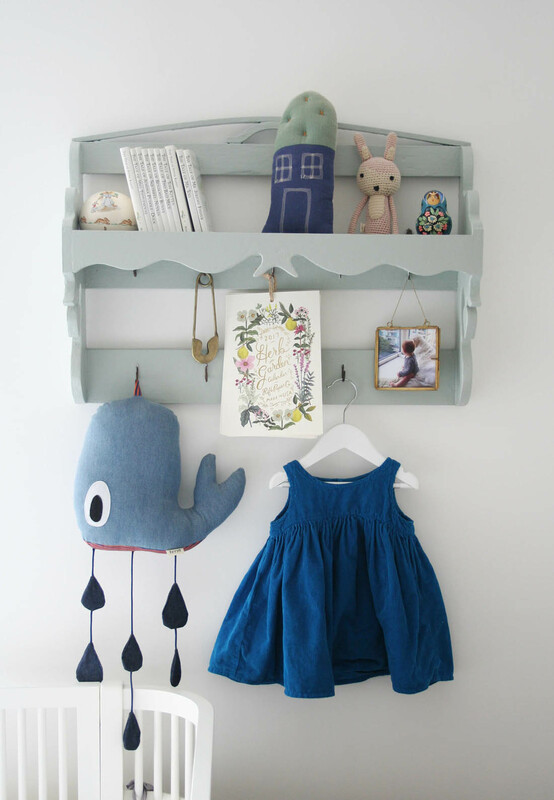 It’s so much fun hunting for the one off products like this pigeon hole shelf for only £25. This would look great in a hallway or workspace. Watch out for the every day essentials like cleaning products, storage solutions and stationery (think French hypermarche style stationery perfect for the start of the new school/work term). I am always drawn to the everyday essentials in store and I was very tempted by these aesthetically pleasing cleaning products. Love this sort of stuff! Honestly, these will double the storage capacity of your kitchen cupboards, they’re brilliant. 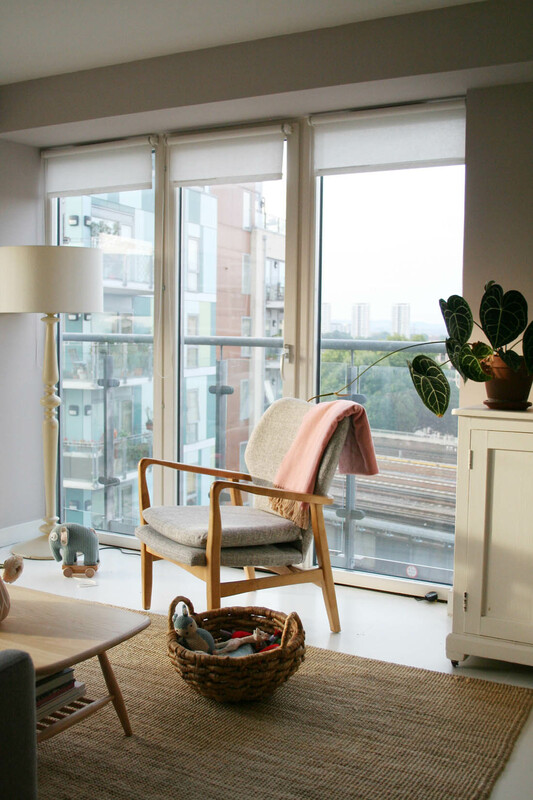 Watch out for a couple more posts in which I will show you what I bought – one big purchase for the living room and a few essentials to help re-organise my wardrobe. Hello, hello! How are you all? Hope everyone is having a brilliant summer – have you managed to squeeze in a lovely holiday? Lots has been going on here behind the scenes as I’ve been working on launching a new venture – more on that to come soon – and Jules is in the process of changing jobs so we have spent the summer in London. Mimi is growing so, so fast and we have well and truly left the newborn days behind us; she has hit the six month point with a very quick crawl so I think my next interiors project will be baby-proofing our flat (that’s a project I’d prefer skip to be honest). 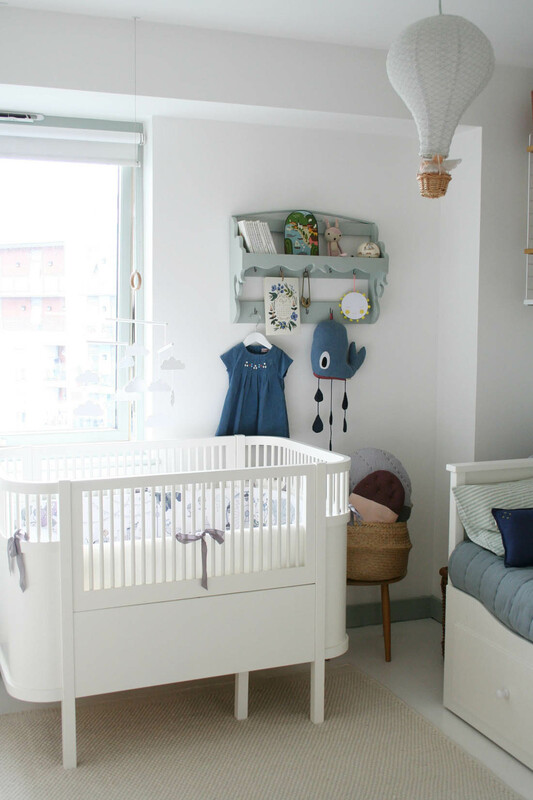 I have had lots of questions since posting pictures of Mimi’s nursery (you can see the full tour here) about how she has been getting on in her own room. We actually moved her in there when she was four months old, a couple of months earlier than is recommended, as she started sleeping through the night when she was eight weeks (lucky us, I know!) and having her in our room meant we disturbed her when we came to bed and she disturbed my sleep as I woke with every tiny noise she made so it wasn’t really working for either of us. 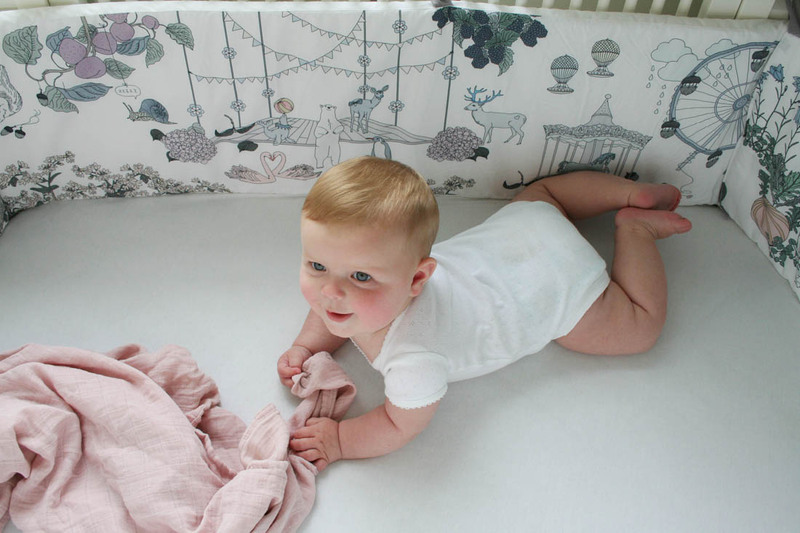 Also, she started to become quite mobile at four months old and was busting out of her co-sleeper – we had the Snuzpod, which was brilliant – so it felt like the right time to move her to her big girl cot, the beautiful Sebra Kili cot bed* (see how we made that transition at the bottom of this post). We got the cot from Houseology and although they have since sold out they do have some other rather lovely kids furniture and accessories including this baby rocker that’s the most stylish baby item I’ve ever seen! You can see Mimi happily rocking in hers here. It goes without saying that the Sebra cot is beautiful and I won’t deny that the Danish aesthetic was the main thing that attracted me to it. However, I was very interested to know whether the design would live up to the practical demands that would be placed on it. I couldn’t find any thorough reviews of it online so I hope this will be useful to anyone considering getting it for their own child. Before I go on, I do want to acknowledge that Mimi sleeps incredibly well – I know sleep can be a very sensitive subject with parents so I just want to make clear that I know how lucky we both are and I don’t want anyone to think that I am making light of the issue. Garbo & Friends cot bumper from Smallable. Anyhoo, back to the cot. Other than how beautiful it looks (it genuinely is the first thing anyone comments on as soon as they walk into the nursery) the second thing that appealed to me about the cot was its smaller than average size. I really wanted to have a day bed in the nursery for feeding during the day and if family wanted to stay so we didn’t have a huge amount of space and some cots are flipping huge! The Sebra Kili cot bed is the perfect size for a small room but doesn’t feel restrictive for Mimi. Also, it is designed to grow with your baby as the sides are removable so it can become a toddler bed and the ends stretch out to become a junior bed until the age of about seven with a mattress extension piece. This justifies the high price tag, in my mind, as there’s no need to invest in a toddler or junior bed. Before Mimi was born I really had no idea how I would use any of the ‘baby stuff’ and I kind of thought I wouldn’t use the cot at all until she was ready to move into her own room at six months old. However, the base of the cot is adjustable so that you can have it at its highest level and easily reach a newborn. That made it the perfect place to safely pop her down when she was teeny tiny if I needed to be hands free or to dress her there. Look at this cute picture of the one and only time I managed to put her down there for a nap when she was teeny. As she got a bit more alert she loved lying there watching a moving mobile so that gave me precious time to do the million other things I had fallen behind with. As she began to move around and learning to roll she loved playing in there and exploring how to use the sides of the cot as launchpads for movement. It was definitely a very well used space. Once Mimi moved into her own room and we made the tricky transition from co-sleeper crib to full size cot we lowered the mattress base and I really began to appreciate the design. Unlike most other cots the bars don’t go all the way round at mattress level so it feels so much cosier and less exposed. We stayed with family recently and she slept in a traditional cot with bars and she woke up so many times with stray hands and feet getting caught between them and she got so distracted being able to see straight into the room. I really, really love that the Sebra cot’s sides are blocked in and I think it made the transition from crib to cot so much easier. Mimi’s nursery. 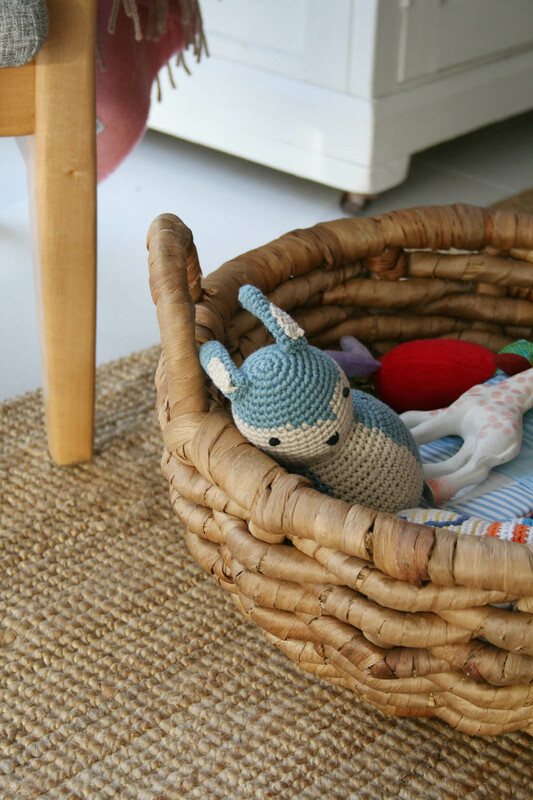 You can see the full nursery tour here. By adding a really sturdy thick foam bumper* this has become the perfect cot for Mimi; she loves it and sleeps so well. The bumper stops her banging her head, which is what she was doing when she first moved into the cot as she moves around so much in her sleep and whilst she’s settling herself. It also makes it feel more cosy and she often rests her back against it and sleeps on her side or wedged into the corner. So cute. 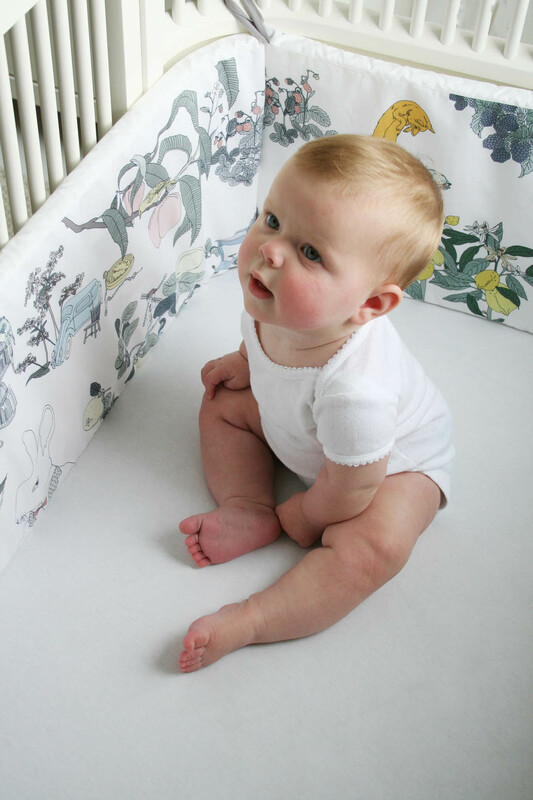 I chose this cot bumper from my favourite kids’ store Smallable because I really wanted to use wallpaper in Mimi’s room as I can remember my own when I was a small child and all the stories I would make up based on the characters in the design. However, we didn’t really have the time to paper the nursery so this bumper feels like a really good alternative. The beautiful detailed illustrations are quirky and unique and I can see us basing bed time stories around the funny characters for years to come as the bumper can be used when it becomes a toddler bed, too. Sometimes, I hang around out of sight when I put her to bed or down for a nap and watch her stroking the bumper and chatting as though she’s trying to play with the funny animals in the drawings. She’s too much! When Mimi grew out of her swaddle bag at about 12 weeks we decided it was time to go “swaddle-free”, which was a major step as she had slept in it since week two and I’m pretty sure it was the biggest contributing factor to her sleeping through the night. She thrashed around like a baby dolphin without the swaddle but she was also in a Sleepyhead so that helped and after a few nights she was pretty settled again. At about 16 weeks we decided to take away the Sleepyhead as she was just getting too big for it and started to look uncomfortable. Therefore, we put her into a sleeping bag straight into the co-sleeper crib. Again, it definitely unsettled her and she thrashed around and woke herself up but after a few nights she was ok.
At 18 weeks when Mimi learnt to roll we decided it was time to start the process of moving her into her big cot in her own room. The first thing we did was place the crib into the big cot so that she could get used to being in different surroundings but still have the comfort of her familiar crib. We also hung the mobile she had had over her crib in our room over her big cot, as well as taking her light show and the same toy. This worked really well and I don’t think she even noticed that she’d changed rooms. At 22 weeks (I should have done this a lot sooner!) I realised that the reason Mimi was waking up so early was that she was desperate to roll over in the crib, still placed inside the big cot, but couldn’t as the crib was too small for her to move around in. I made the decision that the crib had to go and we needed to finally rip the plaster off and put her in to the cot properly. The first week in the cot was quite unsettled as she was learning to crawl at this time so she would wake herself up by moving around so much and start doing laps of the cot. Also, because she had been so used to being so snug in the Sleepyhead and then the small crib she couldn’t get over the fact that she suddenly had so much space. She never really cried or got upset to the point of me needing to go to her during the night but she was more tired during the day as she had had less sleep than normal. I was also tired as I would wake when she did and stay awake worrying about her. The best decision we made was to get a cot bumper as this stopped her banging her head when she moved around and gave her a feeling of cosiness again. Since we put the cot bumper in she has not woken once during the night and she is so happy in her cot. 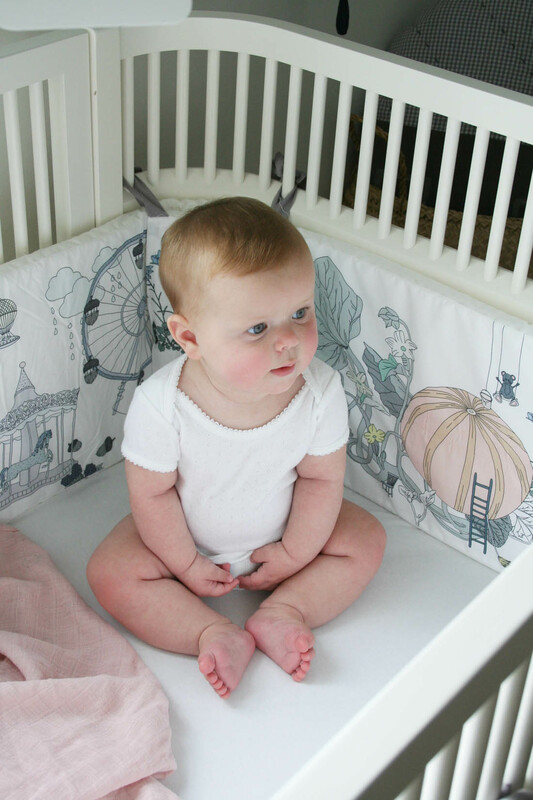 I mean, just look at her (and that dreamy cot!). If you do have any questions about the cot please do leave a comment or pop me an email. Obviously, I haven’t tried it out as a toddler or junior bed yet but I would highly recommend it as a cot for a baby. We are both very, very happy with it.